I'm not sure this quote has anything to do with the photo above, but I thought it was great and wanted to share! Maybe it means you should play hooky today and explore Unaka Mountain. After all, this quote reminds those of us who are tempted to become complacent in our comfort that a life devoted to the pursuit of security is no life at all. This shot was taken from a favorite vantage point on Unaka Mountain in Unicoi County, TN called Horseback Ridge. If you're looking for a wow place, a magical place - this is it. 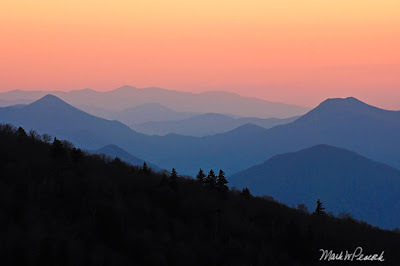 The Unaka Mountain Road is one of the most scenic, and roughest, drives in our area. For a dozen miles, this gravel road snakes around the mountain, offering breathtaking views and terrific hiking opportunities. Click here to see a map of Unaka Mountain. Here is a more detailed description: When you turn on Red Fork Road (aka Unaka Mountain Road), reset your trip odometer and proceed up the mountain. At 1.2 miles, you'll pass the parking area for Red Fork Falls (look for a large red dot painted on a tree!). Click the link for a description of that difficult hike. After experiencing the falls, continue driving. At 2.2 miles, just before the road turns to gravel, you'll see a very small (man-made) waterfall to your left (Clear Fork Falls). Continuing straight up the gravel road, at 4.9 miles you'll reach a sharp, hair-pin turn -- if you look closely on your left as you go around this turn, you'll see a trail heading off into the woods, this short connector trail (1/3 mile?) leads to the AT. Keep driving and eventually you'll see some outstanding glimpses to your right of Iron Mountain and Roan Mountain. At 6 miles, you'll pass by the parking area for Stamping Ground Ridge on your right. Sadly this area is overgrown, but still fun to explore. At 6.3 miles, you come to a very small pull-off area (as you emerge from the forest and round a left-hand curve) and unmarked trail head for Horseback Ridge to your right. This is definitely worth the stop. At mile 7.2 you'll come to a turn-off to your right for Unaka Mountain Overlook, this short side road is often in very rough shape, so drive slow. Don't attempt to take a low clearance car up there. The views from the overlook are primarily to the southeast and to the south -- some of the best views to be had from Unaka. Return to the main road and continue on to your right. The next stop is the trailhead to the Unaka Mountain Summit. This is 0.7 miles further on the Unaka Mountain Road and is found at the first sharp switchback -- if you look closely, you'll see a small trail heading off into the woods to the left. Take it and you'll immediately come to the Appalachian Trail, head left up the mountain and you'll reach the magnificent spruce forest in 1.5-2 miles. For the next overlook (Beauty Spot) continue on the Unaka Mountain Road 1.6 more miles until you reach another well-established intersection (at 10.2 miles) and turn left. This side road will take you to a parking area for the Beauty Spot. Park here and walk up the trail and you will quickly reach a summit where the AT crosses the grassy bald. After taking in the great views there, it's 2 more miles on the Unaka Mountain Road to reach the paved Rock Creek Road (route 395), which will lead you to Erwin, TN (6.2 miles to your right). While they've greatly improved the Unaka Mountain Road in recent years, I'd still strongly recommend a high clearance vehicle. This is especially true following heavy rains that create deep gullies on the mountain road. In the winter months this road is gated and closed from Clear Fork Falls all the way to Indian Grave Gap -- and for good reason, this is a steep, narrow, dangerous, winding road that tends to freeze over and stay frozen long after roads further down the mountain are clear of ice and snow. If planning a trip to Red Fork Falls, please follow that link to read my description of the hike and my warnings about this beautiful, but dangerous waterfall. Click here for my safety tips and warnings before heading out. Happy trails! My husband and I have covered Unaka and Holston Mtns over the years. I'm very glad to have found your site! We are so fortunate to live in such a beautiful area with such beauty all around. 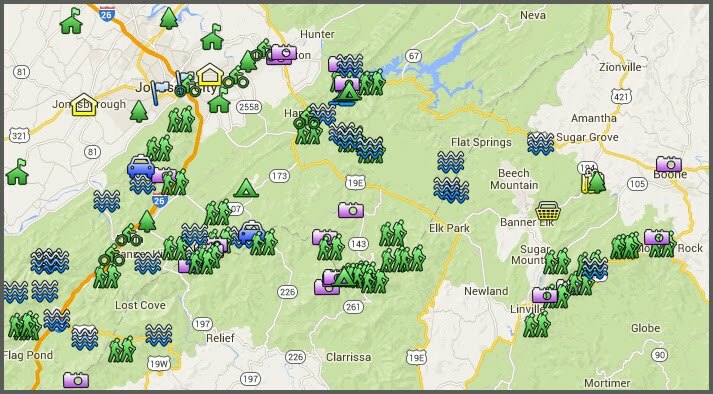 So many ideas of hikes in and around home (Kingsport)!! Thanks for all your good info! I just found this blog and it is amazing! I can't wait for me and my son to start on this bucket list! This is great! I am looking forward to exploring this area. Thank you for sharing. I just drove this road on March 18, 2016 in a Jeep. However, you can go on Unaka Mountain road in a regular car, too. A couple of rough spots you have to pass slowly. The overlook is beautiful.but be aware that all other sights mentioned are not marked at all and are hard to find, unless you have a map or print directions in advance ( no reception there). Also the trees block views in most places along the road, except some viewpoints and curves,and outlooks. So it's probably best to go in the fall for colors and when there are not many leaves for views (late winter or early spring), unless you are willing to get out of the car and hike a little down to pass the trees.